DONALD J. TRUMP: And they hold it up till after a deal is made with North Korea. Does everybody understand that? Do you know why, right? Do you know why? Because it's a very strong card and I want to make sure everyone is treated fairly, and we're moving along very nicely with North Korea. We'll see what happens. Certainly, the rhetoric has calmed down just a little bit, would you say? Would you say? And we'll see how it all turns out. Maybe it'll be good and maybe it won't. And if it's no good, we're walking, and if it's good, we will embrace it. But it's going to be very interesting over the next period of time. And South Korea has been wonderful. But we'll probably hold that deal up for a little while, see how it all plays out. HUGH HEWITT: We're joined now, America-- Morning Glory-- by Dr. Larry Arnn on the Hugh Hewitt Show. It's time for the Hillsdale Dialogue. But I wanted to, since we're talking about the Constitution, begin our time together, Dr. Arnn, by playing a little bit of the president in his role as commander in chief as outlined in Article Two, Section Two of the Constitution, conducting American foreign policy. Happy Easter to you. A blessed Passover to our Jewish friends. What do you make of that comment by the president? LARRY ARNN: Well, that's what the president's for. One of the most important provisions in the Constitution of the United States is the appointment of the president as commander in chief. And when somebody gets that job, they're stronger today than they should be because the Constitution is warped in many ways, but not as regards this function. One voice to the outside world and one voice in command of the military in war time and peace. And I will tell you that Winston Churchill had various views over his life about whether the British or the American Constitution was superior. He never really thought the American was superior, but he often thought it equal. But he never varies that the commander in chief provision would be a blessing to Britain, if he could get it. It messed up Britain in the First World War that they didn't have it, and he effectively achieved it in the Second World War. HUGH HEWITT: When he took command as being minister of defense at the same time that he was prime minister, correct? LARRY ARNN: Yeah. And then defended that job. There was a vote of no confidence against him in 1942. And they had a really brilliant great bunch of war heroes, including Admiral Roger Keyes, who had been promoted to that by Churchill. He came and said, he's doing too much, he has to sacrifice one of his jobs. And early on, Churchill disrupted the debate by saying the House can have all of my jobs on any day, it can't take one of them. And then Keyes stood up and said, I withdraw my support for this motion. HUGH HEWITT: That's the parliamentary approach. I love that. Well, I have spent-- given that he is commander in chief though, that I had in mind that we would talk today about how you assemble around you teams of leaders, and that goes right into it given that we are on the cusp of confirmation hearings for CIA director Mike Pompeo to become the secretary of state, for John Bolton, doesn't need a confirmation hearing. 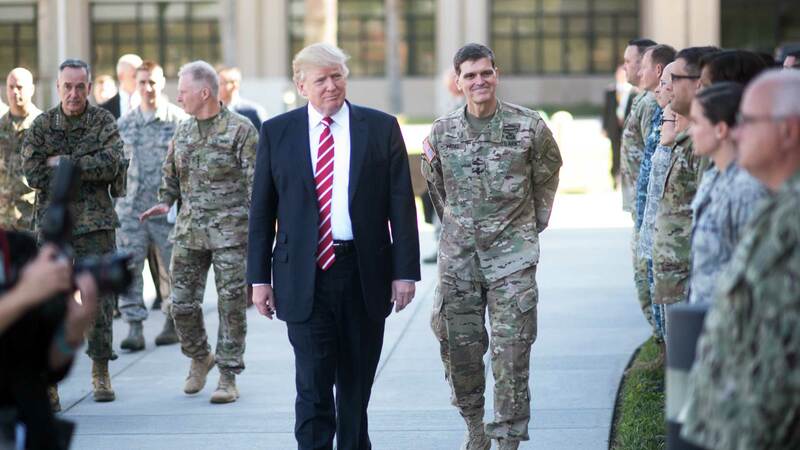 He will be arriving at the White House on April 9th as the national security advisor, and will office next to General Allen, the chief of staff. Joe Dunford is in his job, Jim Mattis is in his job, but Gina Haspel needs her job confirmed over at the CIA. And so I described it to Stavridis as Mike Pompeo will be the president's right arm, James Mattis his left hook, Bolton and Allen his corner men, and Gina Haspel and Dunford the ones up in the box doing grand strategy and maybe sending notes down. What do you think about this team? What do you think specifically of Mike Pompeo? LARRY ARNN: That's a good image. So I know Mike Pompeo pretty well. I know him through Tom Cotton, they're friends. And he's a impressive man, of course. He's a soldier. He has a distinguished war record. HUGH HEWITT: I'm surprised that Tom Cotton knows anything about football. He's from Arkansas. LARRY ARNN: Yeah, there you go. Well, I would make a joke about Ohio State and their ability to read, but I'd be on weak ground when the Razorbacks come up. HUGH HEWITT: So you watch some football. Actually, that's very good. It's like playing a round of golf with someone, watching a football game with someone. LARRY ARNN: Well, Tom Cotton's wife is a big time Packers fan. HUGH HEWITT: Oh, that's sad. LARRY ARNN: That's partly just-- she just cottoned on to them when she was young. And she's from Minnesota. LARRY ARNN: Isn't that odd? LARRY ARNN: But she loves the Packers. And so they came over to watch a playoff game where the Packers won, although they didn't win the Super Bowl that year. So the rest of us were all very glad to support Anna Cotton. And it was fun. And mostly it was the kind of conversations you'd have at a football game, right? We talked about every-- talked about business some, about politics some, but we talked about every kind of thing. And yeah, so I think Pompeo is one of the most steady, reliable, informed guys. And he's got real strength of understanding. So I think he's going to be super at that job. HUGH HEWITT: I had the great honor of shaking hands with George Schultz this week up at Hoover. And of course, he introduced himself as a Marine to the assembled gathered there to listen to Scott Pruitt, who is doing things and shaking things up and, as a result, getting the attacks with the left growing with increasing fury. But George Schultz introduced himself as a Marine, but I thought, Pompeo can stay as long at Trump's side as Schultz did at Reagan's. And I am reminded of late Reagan team of George Shultz, Howard Baker as chief of staff, James Baker as the secretary of the treasury. Over at the CIA they had Bob Gates, of all people. They had quite the collection of talents. And I think with this collection of talents, we're getting close, which brings me to Bolton. I have to play for you-- and you know John Bolton well and I know John Bolton well. Here is Secretary of Defense General James Mattis welcoming John Bolton to the Pentagon yesterday. Cut number one. JOHN BOLTON: Mr. Secretary. It's so good to see you. JAMES MATTIS: It's good to meet you. JOHN BOLTON: Thank you very much. JAMES MATTIS: Thanks for-- thanks for coming. JAMES MATTIS: It's good to finally meet you. SPEAKER: --could you take a question? JAMES MATTIS: I've heard that you're devil incarnate and I wanted to meet you. HUGH HEWITT: Did you hear that? I heard you were the devil incarnate and I wanted to meet you. LARRY ARNN: That's a Marine talking. HUGH HEWITT: What do you think about John Bolton? This is his-- he's prepared his entire life for this job. That's what I tell people. Talk about the smartest guy in the room, I don't know who wins the Jeopardy game between Mattis, Pompeo, and Bolton, do you? LARRY ARNN: Well, they're-- so there's a wonderful-- I've been thinking like this for the last few days-- there's a wonderful passage in Bruce Catton's biography, History of the Civil War. And he talks about the day on the presidential yacht in the Potomac when Ulysses Grant and Phil Sheridan and William Sherman and Abraham Lincoln sat down to confer. And he said-- Catton remarks that when those four men were finally assembled together to work together, the war was decided in principle. And Lincoln, like Trump, went through a lot of people to get the ones he wanted. And I've noticed that these appointments get stronger. And see, I think HR McMaster is a great guy. And I think Bolton is better suited than anybody to be national security advisor, and that's the only reason he would be better than McMaster. And so yeah, I think it's exciting. I think they're going to know what they're doing. And I think they're probably going to get along. That's always hard to say. And Madison and Bolton don't know each other. But Bolton is-- Bolton is kind of a foreign policy establishment on both the left and the right among the thinking classes, or chattering classes, whichever they are. And they have reached agreement about some things in the past that didn't always turn out to be fortunate. And Bolton has often been a rebel against that. So I think he's going to think like Trump about protecting the interests of the United States first. And I think he's going to see that our strategic position is difficult. And it's lately getting worse. And so I think he's going to understand that he's maneuvering in a situation where we need to be smart. And if we are, we'll be fine. And we need to build some more weapons too. And as we saw from this last budget deal-- people need to understand this-- the last spending bills are just outrageous, just massive. And on the other hand, that's the kind of game, same game that went on in the Reagan administration where you couldn't get military increases through the Congress without paying for them twice over or more. So we need to look at these countries that we're up against-- Iran, and North Korea, and Russia, and China. They understand weapons first before they understand anything else. So all this talking and stuff, that list of people that you just named, some of them are diplomacy, that's their job, and some of them are military power. And the great Harold Rude, teacher of mine, used to teach a class called diplomacy and military power, those two things go together. HUGH HEWITT: We'll be back to talk about how with Dr. Larry Arnn. Hillsdale College, hillsdale.edu. Sign up for Imprimis. All of our prior Hillsdale Dialogues, including this one on the commander in chief and his team, available at hughforhillsdale.com. And I will be right back with Dr. Larry Arnn on this Good Friday. Stay tuned. JAMES BAKER: John's an extraordinarily bright guy. I gave him his first job, I think, in government, in the first Reagan term when I suggested that he'd find a spot in the White House Counsel's Office. He was very effective for us. He was effective in the first Bush administration, controversial in the second Bush administration. John has some very deeply held views, many of which I disagree with fundamentally, but I know he's a patriot, and he's an extraordinarily able and capable public servant. Now, will he get along-- will he defer to the secretary of state the way he should? The job he is now in is one of consensus and coordination, not so much one of articulating your own views, although you're free to express those to the president. Time will tell. HUGH HEWITT: That is former Secretary of State James Baker, one of the great living Americans, also a Marine like George Shultz. I am in the Hillsdale Dialogue with Dr. Larry Arnn, President of Hillsdale College. All things Hillsdale collected at hillsdale.edu. And all of our conversations are found at hughforhillsdale.com. What did you make of Secretary Baker's assessment of John Bolton? They have a mutual admiration society, which surprises a lot of the people you refer to as the sometimes thinking, sometimes chattering class. Often they do both, sometimes they do neither. But what did you think of that? LARRY ARNN: Well, I was reading the paper this morning about Bolton and Mike Baker. There's a wide range of people who find Bolton impressive and effective. And that was the burden. James Baker just said that the national security advisor is supposed to defer to the secretary of state. Well, I don't think so. I think the National Security Council and its advisor are to advise the president. And they don't work for the secretary of state, they work for the president. And the president needs people around him who can give him their best advice and owe their loyalty to him as the secretary of state ought to. So I didn't think that part was right. But I think Bolton's tough, right? He's very articulate. He's very quick. He's very direct. And so he's an imposing man. And yet there's records of lots of people who worked with him who say, yeah, this guy is a serious guy, watch him go. HUGH HEWITT: There is a debate among presidential scholars about the office of the national security advisor. There is a Scowcroft model, which is the coordinating, whispering model, and there is the Henry Kissinger model, which is the dominating and making sure the last man in the room is the national security advisor model. And you have to choose one or both, maybe on different days. I kind of think John Bolton will be in the latter category. What do you think? LARRY ARNN: Well, I think Donald Trump is likely to continue to be president of the United States until his term is out. And I think he will decide that. HUGH HEWITT: Well, you know what's interesting that goes into this conversation? Mike Pompeo has spent probably more time with President Trump than any other cabinet member, because he does the daily intelligence briefing. And so he's often there-- I interviewed him for MSNBC, on the record he said this-- four times a week. And in every conversation, President Trump brings up North Korea. I know John Bolton's been in and out of the White House, but he does not have that relationship. I know Secretary Mattis is much admired, but he's around the world visiting in trips. The guy who's been there every day has been Mike Pompeo. I imagine he will be, like I said, the right arm of the president. LARRY ARNN: Mhm. Well, but Pompeo is going to move away from the president, right? Just think, the government is huge and all that, and very coordinated, and malcoordinated, but distance, human distance matters, right? And so it's one thing if you go in there four days a week and give him regular briefing that fits a pattern, by the way, which means that he's expecting to talk with you and can have prepared what he wants to say in addition to the briefing. The secretary of state doesn't do that. And so Pompeo, he's got—and he will have—a wider distance from the president just physically. So I think that they'll continue to get on and be close. And I think these conversations that they've had four times a week are going to be valuable, because they're going to both be out around the world making judgments. And there will be a better chance they'll make them better alike, and they confer and get together and agree what they're going to say quicker than if they hadn't had all that. HUGH HEWITT: When we get back we're going to talk about when Churchill would go abroad and leave Eden at home, or take him with him, whether it was to Morocco, or to Iran, or to Moscow. We'll talk about that with Dr. Larry Arnn, Churchill biographer. Every one of these conversations at hughforhillsdale.com Go nowhere, America, expect right here. Dr. Arnn, I had mentioned before the break, we're getting a new secretary of state, Mike Pompeo. He will be confirmed rather quickly, I believe, because we have urgent meetings abroad that are looming. But as you noted, and as I noted at the start of the show, the commander in chief and the head of the executive branch for whom Mike Pompeo works is President Trump. President Trump travels a lot. Mike Pompeo, secretary of state, will travel a lot. How was it with Churchill and his men and women when he went abro-- he went traveling a lot, and in those days coms weren't very good and the traveling was very long. LARRY ARNN: Yeah, and it's such a blessing that coms weren't very good, because they flow, they just stream. We're just about to wrap up the document volume that goes to July, end of July 1945. And of course, that's sad because it's the end of the war, and because Churchill loses the election. And he loses the election right in the middle of the Potsdam Conference, the conference that-- the last meeting of the big three. And they have this really happy conference. And then Russia, within 30 days, had violated all of its main promises regarding Eastern Europe. So Attlee, the deputy prime minister and the man who beat Churchill in that election and put in the first socialist government, is with Churchill, and Eden is there. So who are they communicating with? And the answer is, the war cabinet, five people, two of them gone. And there's a report every day from Churchill, usually just one, although there are various other inquiries and questions of people. He was like Rumsfeld about that. And they're very well put. Churchill could really write. And so one of the main sources of knowing what's going on is these things they write back and forth to each other. And they're not long, but they're precise. And I'll bet Pompeo has the gift of that. Just think, Churchill, in the greatest war in history, is running, not just the government, but the Ministry of Defense. And he's got time to write these things. He dictated them, but it's just like sort of he dictated them at the same speed that you and I are talking right now. You say something, I say something back. Those memos are like that. HUGH HEWITT: Boy, his secretaries must have been exhausted. LARRY ARNN: Oh yeah. Well, there were teams of them, right? And he worked them. They started at 7:30 and they ended at 3 o'clock in the morning sometimes. HUGH HEWITT: Yeah, I bet. So now, in the days when everything is monitored, when every call is collected and processed by hostile intelligence agencies, though, it becomes very dangerous. You've got to have what they call a SCIF, a Sensitive Compartmented Information Facility, in order to do this. What do you think? Does that inhibit? Do you think that holds people back? LARRY ARNN: Oh yeah. And all that's computers too. They probably communicate more freely and frequently today than Churchill could. And what I was meaning to say earlier is, to some extent, that's a disadvantage, because it's probable that a lot of things are not formulated as well as they used to be. You chatter all the time, and that's what email was like, right? As opposed to writing letters. So there's some of that. The two things, what is executive for according to the Federalist and the Constitutional Convention? It's for energy, and it's for responsibility. So energy means, he can act. The president can act. It's just what you know-- Donald Trump, he just acts all the time, right? He's very-- he's creative, imaginative, some say helter-skelter, but gosh, he does big things all the time. And I think there's some direction to them. And now that's-- he gets that. And then responsibility, how do you get that? And the answer is, there's an election coming always. And the Congress is always a problem to the president. This one, with his party in the majority, is not doing big things he wants. I think that might cost them-- I hope not-- in the election this fall. But so yeah, he's got strength and unity to act. And on the other hand, he can be brought up short. HUGH HEWITT: It's so fascinating when you put together a team of leaders. And I know you've done that at Hillsdale. You've done that in other situations before at Claremont Organization, the Claremont Institute. But it's the same for every leader. You've got to be comfortable in your own ability to surround yourself with strong people. As Don Rumsfeld used to say, A's hire A's. LARRY ARNN: Yeah. At the college, our business is complicated. And it happens all over the country and all over the world all the time. And at any given day, there are senior people at the college, they're in four different cities. And so that's right. I got an email this morning about a negotiation in California that is consequential to the college. And the guy doing it is very good, despite the fact that he's a lawyer. HUGH HEWITT: Some of us recover. HUGH HEWITT: I got to pause there. Both Michael Pompeo and Tom Cotton, your football watching friends are Harvard lawyers. And that's actually the most dangerous place of all to learn the law. LARRY ARNN: Yeah, and Pompeo went to West Point, which helps. And Cotton grew up on a farm and served in the Army, and so that helps. HUGH HEWITT: Got the stink of them off the place. But you're right. So you've got this lawyer doing stuff for you in city A, and you've got people in city B, city D. And you're stuck in Hillsdale or at the Kirby Center in DC. And you're running a complex organization. It's always the same thing. LARRY ARNN: Yeah, that's right. And you have to-- the people you work with have to be competent. They have to trust each other. You learn from hard experience people love to keep secrets. It's a kind of a natural tendency, except among the best people. So the default at Hillsdale College is, everybody knows the thing who needs to know it. And you don't-- and if somebody's got a beef with somebody, they-- when I first got to the college, I would do this. They would send me an email about their complaint about somebody. And I would answer it and copy the person they were talking about. And that was a sign to everybody that we really need to figure this stuff out together, don't we? You change the team some as time goes on, because some people don't take to that. But just think of this simple practical thing. If you have a conversation going on with three different people and they're all writing to you about the same thing and you're writing them back, and you can't share it, that troubles the number of communications. HUGH HEWITT: Do you know that one of the most impressive people I've ever met is General Stanley McChrystal, who basically won the war in Iraq by killing Zarqawi. And he took over the special operations there when he was working for Petraeus. And he wrote a book called Team of Teams. And the way he did that, he accelerated the tempo of the special operators, I think it was 700% in that one year-- kills-- kills or captures. And he did that by holding a daily conference call that eventually grew into the thousands of participants. I said, General, how could you hold-- and he would participate. And he would encourage his underlings to rebuke him and argue with them in order to model how you do this. And it's a fascinating chapter. I said, but how could you have that many thousands of people on a conference call. He said, either you trust your people or you don't. And we're in a business that takes a lot of trust, because they're trying to kill us. LARRY ARNN: That's right. And see, if you don't trust them, it's not just that you might fail to trust somebody because they're untrustworthy, but more commonly you might fail to trust somebody because you just don't communicate very well. And sometimes you have to change things like that. I make very few changes in the staff at Hillsdale College, and it's growing, and so it's restructuring all the time, but we all just figure all that out together. And see, that review queue, we have a Monday morning staff meeting. And about a half the Mondays, we can all be there. Most of us can-- almost all of us-- and the rest of it on a TV screen. And the point is, you just watch their faces. If I say, I thought of doing this, and then I'll describe it, and then I-- and just before they even start talking, you just look at them. And sometimes I'll say, OK, so that won't work. HUGH HEWITT: Well, with you, that's probably you've learned to recognize that. That's pattern recognition. LARRY ARNN: That's exactly right. HUGH HEWITT: Before we got to break, I got to ask you this. This brings me to Ronny Jackson, the Admiral who is the president's physician, the White House physician-- he actually serves everyone in the White House, but the president-- who's been named to take over the Veterans Administration. He's being scorned as not having run a large organization. Now, look, you don't get to be Admiral in the United States Navy without being really good. And you don't get to be the White House physician without being really good. There is, in Washington DC, a vanity about experience that is overwhelming to me. It just often credits people with a greatly undeserved expertise, because they've hung around a lot of different buildings with big names and denies that you might have genius in the person of this admiral. LARRY ARNN: There's a highly paid-- in Washington DC-- they're highly paid campaign consultants, who still make a fortune, and who never win. HUGH HEWITT: Who never win. LARRY ARNN: So you think a single big naval vessel is not a big organization? But this guy an admiral, he commands many. So that's ridiculous. Now, it's possible that you could not know the ways of bureaucratic politics in Washington. I was on the board of the Army War College. And I learned, somewhat to my chagrin, that the colonels all want to get a sense of what it's like to be in the Pentagon. Most soldiers happily are not there, because it's very political there. But I don't think experience with that is the thing so much as aptitude for it. You need to be very perceptive. HUGH HEWITT: That's it. Aptitude not experience. I'll be right back. One more segment with Dr. Larry Arnn as we talk about the president's commander in chief, Article Two, Section Two. Don't go anywhere. Plus a question about college admissions on a week that a lot of people are disappointed, with a man who runs a college where a lot of people didn't get in. What do you tell those who didn't? Don't go anywhere. I'll be right back with Dr. Larry Arnn. Welcome back, America. I'm with Dr. Larry Arnn, my friend and president of Hillsdale College, hillsdale.edu. I do this annually with him, I think, this week. A story in the Wall Street Journal this morning. Harvard hit a new low this year in terms of its acceptance rate, writes Melissa Korn. The University admitted 4.6% of its applicants, or 1,962 students for a class at the beginning of the fall. Last year, they admitted 5.2% of applicants. It goes on to note that this is going on throughout. Princeton had a-- 14,200 of the 35,000 people who applied had 4.0 grade point averages. Goes on to note as well that Cornell accepted more than 700 first generation college students. And more than 20% of Harvard admitted students and 23% of Princeton's are eligible for Federal Pell Grants, which are aimed at low income students. It goes on to talk about, just generally, the disappointment and the success of people. And Dr. Arnn, what do you tell those people, not who are happy today, but who are disappointed on their Wednesday letters? LARRY ARNN: Well, if you're serious about going to college, and you shouldn't go unless you're serious, there'll be a place for you to go. And the college system in America is, in fact, overgenerous. We steer people to college who, first of all, too bad they didn't, but they should have been offered a better high school education. And then a lot of people, they should-- what do you need to know? I can list it for you. You need to know human skills, reading, writing, and arithmetic. Those are the reasoning skills. You need to be good at those things. Then you need to know things. You need knowledge. You need history, and philosophy, and literature, and the natural sciences. Everybody needs to know those things. And everybody could know those things through high school, or two years of college, or four. And then everybody needs work, right? So the first thing to know is, it's not the end of the world if you don't go to college. And then the second thing to know is, if you're determined to go, after you heard what I just said, then that means you're probably an excellent candidate to go to college, and there'll be some college you can go to. HUGH HEWITT: And I've tried to impress upon-- everyone ends up at the right place. It's my real view that everyone ends up at the right place. And what you learn at whatever place you end up at is what matters and how you conduct yourself with the best professors that you can find. And there are always some good ones, right? You've got more than your share. You're disproportionately full of good professors. But there are always some good ones anywhere, right? LARRY ARNN: That's right. And my life and I bet your life, Harvey Mansfield, were changed by certain professors we met. And we met a lot of others. And so you look for that. Harvard is unusual. It's Harvard. And it's a single name that means a lot, right? Hillsdale is unusual. It does something different. It's famous for doing something different. It's very stubborn about that. And so, of course, people can be crushed if they don't get into any of the places that are unusually admired by them, because they're unusual. And for us, we're not very big. We're growing some, and going to grow, I think but I have said for 18 years now that there is no earthly reason for Hillsdale College to grow. And there is one now and that is angry letters from old friends. HUGH HEWITT: That's a very good reason. And I know why you get them. Let me, now, tell you about James Pethokoukis. You might know James. Had tweeted out this morning, at college admitted student day with daughter, 17, her orders, quote, "you are on talking restriction, no questions." And other people are replying, been there. And it's because many people are walking around on eggs, right? LARRY ARNN: I took all of my children on a college visit during the course of their growing up. And in three of the cases, the student, my child, was in the room with me, sitting by me, when they were having parents Q&A with like 200 parents in the room. And every time I would hold up my hand I was kicked, so I didn't get to say anything. --and I was able to make a stink. And it is amazing, by the way. Parents should listen to this. I bet our listeners don't do this. But at four of those things that I went to, none of the questions were about what college is really about. They were all about dorm room, parties, friendship, personal attention, success, grades, how do you get a job-- none of that, right? And then one of them, the one where I was especially liberated, I held up my hand toward the end, somewhere where I got a lot of education, and I said, what will you teach my daughter? And what will her character be like when you're finished? Every head snapped around at me. And then the man on the stage said, hello, Dr. Arnn, welcome back. HUGH HEWITT: On that note, Happy Easter. Poor guy. He probably saw you come in the room and said, oh, gosh, here we go again. Dr. Larry Arnn, President of Hillsdale College. Happy Easter to you.